On the black bar on the left, you’ll see a Posts module near the top. When you click on it or roll over it, you’ll see the Add New option. Click Add New, and it’ll open up to the main editing screen for adding a new post. Give the post a title in the title bar (marked in red above), and add text in the main text box below (marked blue). You’ll see typical formatting options above (marked green) — for bolding, italics, etc. Its really pretty much like a little word processor! 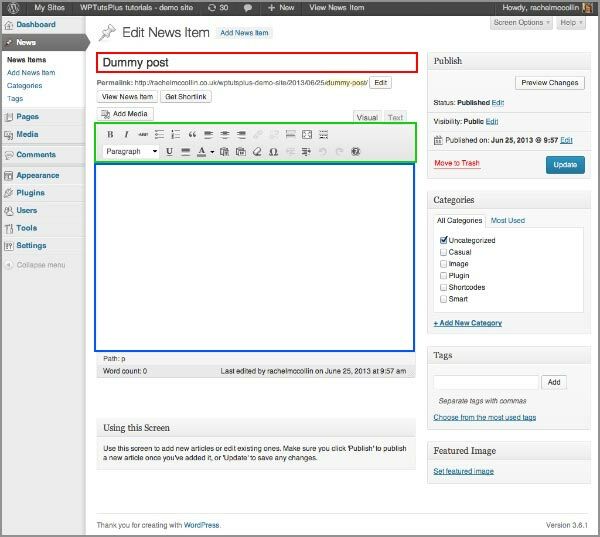 When you’ve finished the post, or made changes to a post, click the big blue Publish or Update button on the right. Here’s some info on pasting text, making links, adding images, etc. Please pay attention to the info about CATEGORIES at the end, as this determines where a post will actually post to (i.e. whether it will post to the Voices page, the Visions page, or the Actions page). If you’re pasting text that you’ve copied straight from some other source, click the “Paste As Text” icon in the second row of formatting options (it looks like a little clipboard, with a T in it). This will paste the text as plain text. Otherwise it will bring in the formatting of the source — which you don’t want. Add the URL for the link in the URL box, check the little box that says “open link in new tab”, and click the blue Add Link button, and that’s it. To add graphics, like photos and drawings, etc, you use the Add Media button up top. 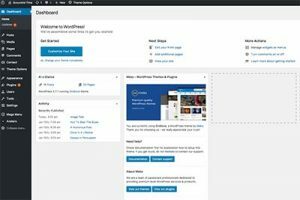 Basically, you’ll just put the cursor where you want the image, hit the Add Media button, choose “upload image”, and upload the image into the post. The Scoundrel Time site is divided into two different types of posts. Under the Voices page, we’re putting all basically text based posts — like essays, poems, humor, dispatches, etc. Under the Visions page, we’re putting all visual based posts, like photos and photo essays, graphics, videos, etc. You’ll notice that the post excerpts on the Visions page — i.e. posts with the categories of Photography, Graphics or Video — all have a photo or graphic in the background of the excerpt box. You add that through the “Featured Image” option, which you’ll find to the right of the editing screen, way down at the bottom. The best thing is if you can pre-size the image before uploading it, to about 400 pixels wide and high. Feel free to play with it till you get the hang of it. If the image you’re using doesn’t work, just remove it, adjust item and upload it again. 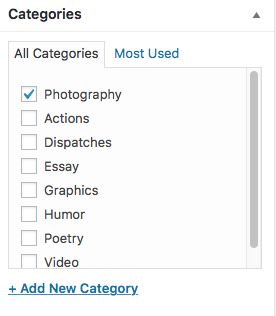 Before you publish a post, you must assign it a category. This will determine whether it will post to the Voices page, the Visions page or the Actions page. There is a single category (as yet) for the actions page, and that is Actions. So, just check off the appropriate category for your given post before hitting the Publish button! I think that’s basically it! But let me know if you have any further questions.